Nor does it have to be sweet and ooey gooey to be considered breakfast. Or from a box. And it doesn’t even have to be eaten in the morning. Enter the hash. A dish of diced or chopped meat and often vegetables sautéed in a frying pan. In other words, the perfect way to start your day when you’re looking for something warm, hearty and satisfying that will keep your blood sugars stable all morning long. 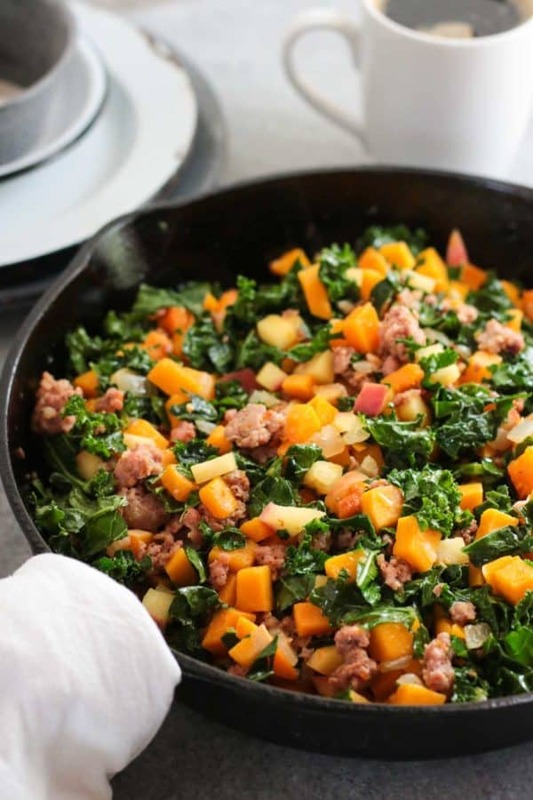 Imagine your breakfast plate piled with tender butternut squash cubes, sweet apples and savory homemade turkey sausage. Maybe even topped with an egg for extra protein and staying power. Yes, this could be your breakfast. Or dinner. We’re huge fans of breakfast for dinner at our house and this hash is often on the menu when winter squash is bountiful and in season. 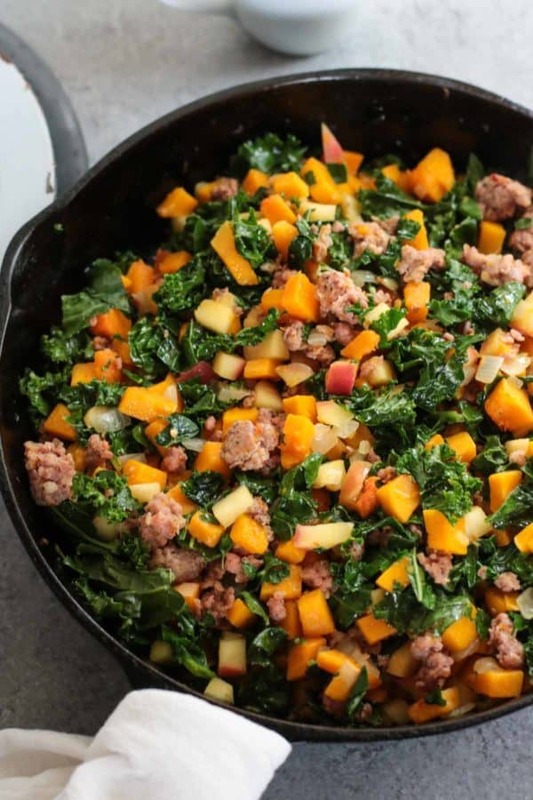 Preparing this dish ahead of time, either start to finish or just pre-chopping your vegetables and cooking the sausage means you’ll spend less time in the kitchen. It also freezes beautifully so consider making a double batch and freezing it in individual portions for a super quick reheat and eat option when you need something fast and filling. Using ground turkey and a few dried spices from the pantry in place of store-bought breakfast sausage saves you money and means you’ll be getting less sodium and no preservatives. Not a kale lover? Replace the kale with spinach or chard or leave it out. It’s still incredibly delicious. So if you’re in a breakfast rut or tired of the mid-morning-post-high-carb breakfast, then this hash is for you. Combine ground turkey, sage, thyme, garlic powder, salt and nutmeg or red pepper flakes (if using) in small bowl. Stir with large spoon or use your hands to combine. Set aside. Place a large skillet over medium-high heat. Add 2 tsp. coconut oil and heat just until oil starts to shimmer. Add onion and butternut squash. Saute for 7-8 minutes, stirring occasionally. Add 3 Tbsp. water and diced apple. Cook an additional 5 minutes, stirring occasionally. Move vegetable mixture to one side of the pan. Add 1 tsp. coconut oil and turkey mixture. Allow turkey to cook a few minutes before breaking it up with a spatula or wooden spoon. Continue to cook 5-6 minutes or until turkey is cooked through and no longer pink. Stir to combine vegetables and sausage. Place kale/chard/spinach on top of hash and cover with a lid. Allow greens to wilt, about 1-2 minutes. Stir, season with additional salt and pepper and serve. Have you tried this recipe yet? If so, we’d love to hear what you thought of it in the comments below. Very yummy! Only had half a squash so subbed in some sweet potato. I also doubled up on the spices for more flavour. I would definitely make this again. Way to make use of what you had on hand. So glad you loved it! How much sausage is used? I do not see this in the ingredient list of the recipe but it is in the name and in the directions. Hi Diana, the ‘sausage’ in the recipe directions is the turkey sausage that you make in the recipe. If substituting sausage, you’ll want to use 3/4 lb. Sorry for the confusion! Is the fat listed the saturated fat? I’m trying to figure out WW Smart Points. Thanks! I can’t wait to try the recipe. Sounds yummy. The fat listed is total fat. Do you know what the saturated fat is? That’s what I need to track it. Thank you! I’d suggest plugging the recipe into MyFitnessPal to get the information you’re looking for. They now have a feature where you can add a recipe using the URL to make it quick and easy. Made this meal for my wife and I. She is on an anti-inflammatory diet for fertility. It blew us away! Fantastic!!! Leftover were wonderful and even 2 days later we added to our egg breakfast! Awesome! Glad it was a hit! I made this but for time and availability’s sake I used 10 oz. frozen diced butternut squash and 12 oz. frozen kale. This recipe is delicious! I separated out by 1 cup increments and got 5.5 cups. I made 4 individual breakfasts for the week and the rest I ate for dinner. I also did add a pinch of red pepper flakes. Will definitely make again! Hi, I have some acorn squash leftover from a recipe last night. Can I use this instead? Also, can I substitute Aidell’s Chicken-Apple sausage? Yes and yes! 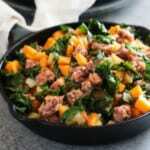 I love your idea of putting leftovers to use and using a pre-made sausage to make quick work of this hash. THIS HASH RECIPE IS EVERYTHING. It is so delicious that I will be making this forever in my life. I’m doubling the recipe so my partner and I have breakfast for several days and this has tastes even better a day later (although I have to cook the sausage separately because it won’t fit in the same dutch oven). When I have time, I top mine with a sunny side up, runny yolk egg and it is insanely good. I added a bunch more spices: paprika, cumin, cayenne, thyme, z’atar, and lots of red pepper flakes, and a little more kale. Followed the rest of the recipe to a T. I love, love, love this recipe. Love love love. Thank you for bringing this into my life! Thank you! We love your excited for this recipe and your suggestions for spicing it up! Just made this for lunch… wow, so good! Yes! So great to hear! Can you advise me on freezing and thawing the whole casserole in advance of a weekend brunch? Thank you. We’ve not tried freezing this hash from fully cooked then thawing and reheating though I’m sure it’s not impossible. I would suggest cooling the dish completely before freezing then thawing in the fridge (this may take a day depending on the size of your dish and if you make a double batch, etc.). To reheat, you’ll want to cover with foil then reheat in a 350F oven until hot, then remove the foil and either bake a few more minutes to brown the top a bit or put it under the broiler if you like to take some of the moisture off. Absolutely one of my favorite breakfasts to make for meal prepping. Quick, easy, and the taste is out of this world. Made this for brunch this morning. Simple to make and very tasty. I also topped it with a poached egg. Will definitely make again. So great to hear you enjoyed this recipe! The poached egg on top sounds delightful! Delicious. Didn’t have squash, so I used sweet potato, no kale, so I used spinach. My son’s trying to eat healthier and he said, “I think I could eat this every day for breakfast and lunch!” He packed the leftovers for lunch tomorrow. Such a delicious recipe! Beyond excited about eating this on my 2nd week of Whole30. I made some modifications like adding mushrooms and spinach but it is such a great hash to pump in vitamins and nutrients via veg!